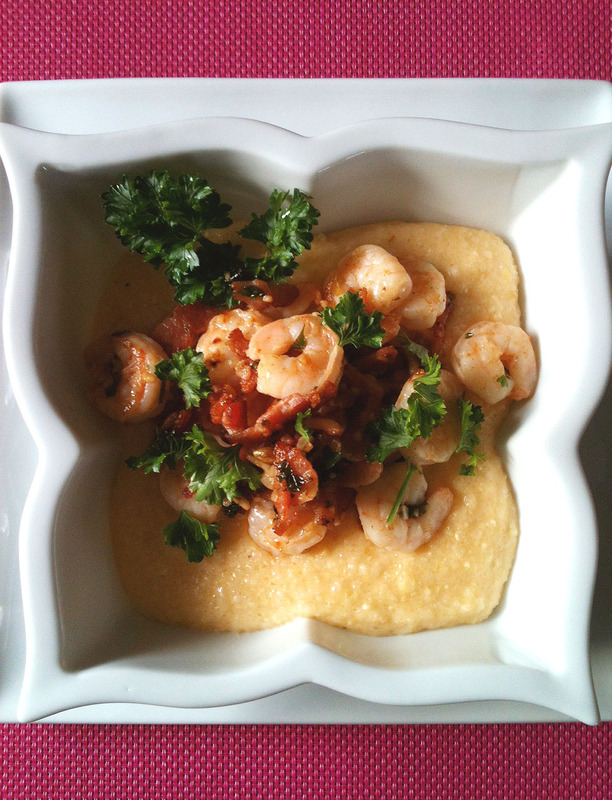 Shrimp n’ grits is one of a handful of dishes that make up classic southern cuisine. And like most ‘classic’ dishes, everyone’s got a riff that they say makes it ‘the ultimate’ version of that dish. I’m sure this one isn’t ‘the ultimate’ (I’ve tested some of the popular versions) it certainly is easy, takes about 10 minutes and packs a world of flavour. Plus it has bacon. How can you go wrong?? Some of you may be asking the question, “What is a grit? Whatever it is, it doesn’t sound tasty.” Well, let me assure you grits can be plenty tasty and that it’s basically the south’s version of Italian polenta – cornmeal , slowly turned into a fluffy cereal pudding by boiling with water or other liquids. In other words, the corn version of cream of wheat. Southern grits are white corn vs. yellow. The ones I buy (in the US as they’re very difficult to find here) are the Quaker brand quick cook grits in the blue tube. If you can’t find these, substitute large stone ground cornmeal (like Bob’s Red Mill). The other secret ingredient is something decidedly NOT traditional – Jalapeno Tex Mex Cheese Whiz . Don’t be afraid – I was not a Cheese Whiz believer either until a friend (thanks April) turned me on to how good this newly minted flavour of the faux cheese was. It’s fantastic just melted down on top of tortilla chips (just like movie nachos!) and likely many other tasty combinations I’ve yet to discover. The rest of the ingredients should already be in your house or at least the local grocery store. This recipe will come together quickly so do your mise-en-place before starting. Place the grits into a microwave bowl and add the water and salt. Stir with a whisk and place in the microwave until later. Use some kitchen shears to snip the green onions, parsley and bacon vs. using a knife. It’ll go way faster. Cut the lemon in half. Prep your garlic and have your shrimp handy. On a medium high heat, begin frying the bacon pieces. When they’re almost crisp, remove them from the pan and set aside to drain on paper towel. Now you can turn the grits in your microwave on for 4 minutes on high. While they’re cooking throw the shrimp in the pan with a dash of cayenne. Add in the squeeze of lemon, the green onions, the garlic and the salt & pepper. Stir. Now go check on your grits. Give them a brisk stir with a whisk and pop them back in the microwave to finish. Go back to the shrimp and add the parsley and stir a bit more. Cook the shrimp about 3-4 minutes or until thoroughly pink. Add the bacon back in at the end to reheat. When the grits are done (they should be after 4 minutes), throw in the Cheese Whiz and stir briskly with the whisk until the cheese has been fully incorporated. Place several spoonfuls into a bowl and top with some of the shrimp mixture. Enjoy the creamy spicyness! I’m so glad you got me to come to the dark side.